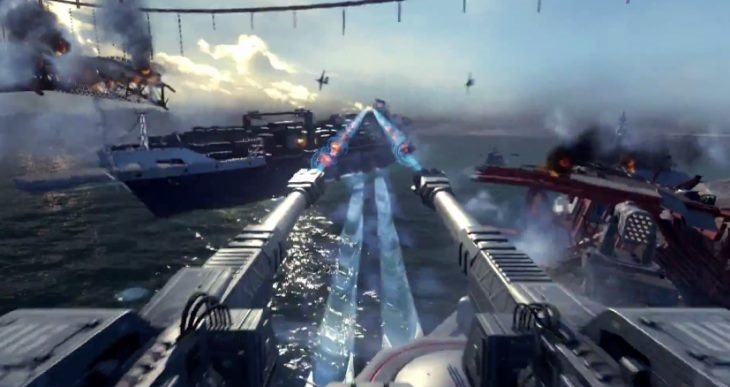 As the resident Call of Duty gamer it falls to me to say what I’m excited (or interested) about in the new Call of Duty: Advanced Warfare from what I’ve seen in the trailer. Now remember this trailer is for the single player version of the game so we don’t know how many of these features will be included in multiplayer. So in chronological order of this trailer, here we go. In the entire last generation Microsoft had secured the Xbox 360 as the lead platform for the Call of Duty series, and it looks like this has been renewed for the current generation. The trailer was captured on an Xbox One and this leads us to believe all DLC will arrive on the Microsoft platforms first – and presumably, the world champs will continue to be hosted on the Xbox One. Obviously this is all about Microsoft throwing money at Activision. Hate it or not that’s how it works. 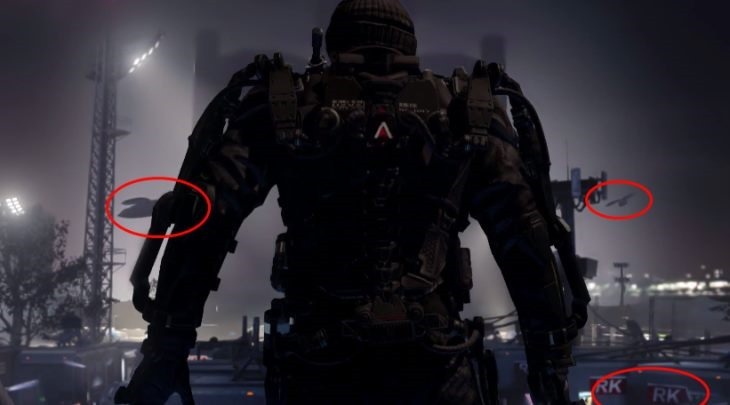 The very first graphic we see is a soldier wearing an exoskeleton. 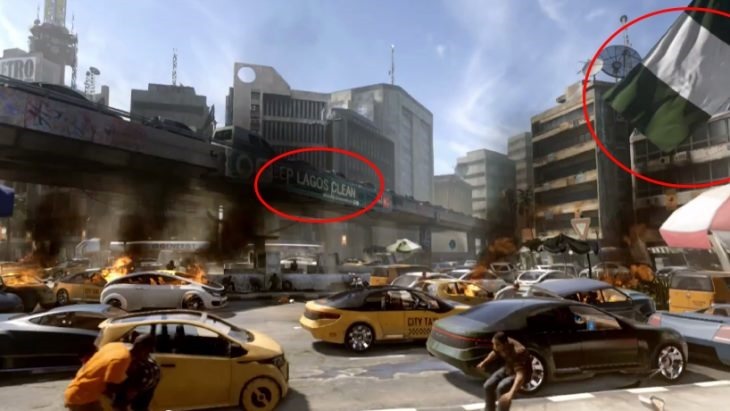 As in previous modern Call of Duty titles the developers try to stick to current or nearly current technology. Exoskeletons currently exist and are in development for the military. 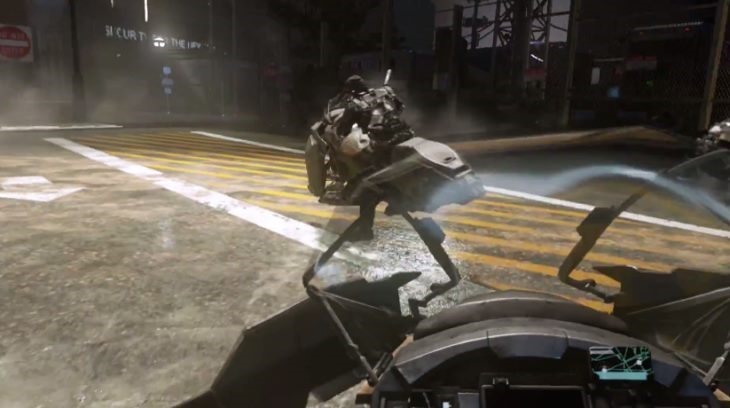 We see further in the trailer that the exoskeleton appears to be used to enable the player jump further. Take a look at the 40 second mark. We can also see from this screenshot that quadrocopter drones (top right) are still in the game and a bit further on we get to see a full swarm of them. On the top left we see a relatively modern attack helicopter and on the bottom right what looks like a corporate logo bringing in the feeling that this version is not going to be nation vs nation but rather predominately private military organisations. We then hear the unmistakeable voice of Kevin Spacey and as the trailer moves on we also see that the character he is voicing looks exactly like him. The idea of integrating gaming directly into the mainstream movies and TV series is a great way to capture the minds of the mainstream gamer. Not only that but as Kevin Spacey is currently starring in political drama, House of Cards – and the idea that he is talking politics is great. They are also touching on a strong point the world is debating at the moment and that is whether military force really can, or even should, bring democracy to places like Syria, Ukraine and Libya. We quickly again see the private military guarding what appears to be civilian prisons. The prisoner we can see is dressed in normal clothes and acting very casual making me believe this is not a criminal prison but rather something like an emigration holding cell. At 0:24 into the video we see a military attack helicopter de-cloak while a soldier of the Atlas corporation looks on. Now in the last Ghost Recon, Future Soldier, we were told by the PR guys that cloaking technology was nearly here. Unsurprisingly the army hasn’t quite got it right yet but once again it looks like it will be used in a game. During the time that Kevin Spacey states “These countries don’t even have the basic building blocks to support a democracy” we see the following screenshot. Where we can clearly see the Nigerian Flag (top right) and the city name, Lagos, in the middle. Now seeing that Nigeria is now the biggest economy in Africa I can see some people being upset by that but at the same time over 200 school girls were recently abducted from that country supposedly as prizes and brides for militants, so yeah I have to agree with Sledgehammer here. They are obviously not ready for a true democracy. As usual the game is going to be shipping us all over the world with a quick shot of the Golden Gate bridge letting us know that we are going to be in San Francisco for part of the game. Spacey’s monologue continues and he brings up the three-pronged issue of why they should tolerate people who disagree with them, why they should allow people to follow different gods and why the media is allowed to disagree with the president. It raises a lot of ideas on how the game will play out. He is definitely sounding like your stereotypical dictator except this time he isn’t trying to win votes or support but rather rule with absolute power from the very beginning. And something to make all Star Wars fans excited it looks like the next Call of Duty is taking some inspiration from a geek’s favourite movie and introducing hover bikes into the game. The basic exoskeleton that allows players to move faster, further and quicker doesn’t appear to be the only one in the game with this hulk of an exoskeleton getting a few seconds of screen time. 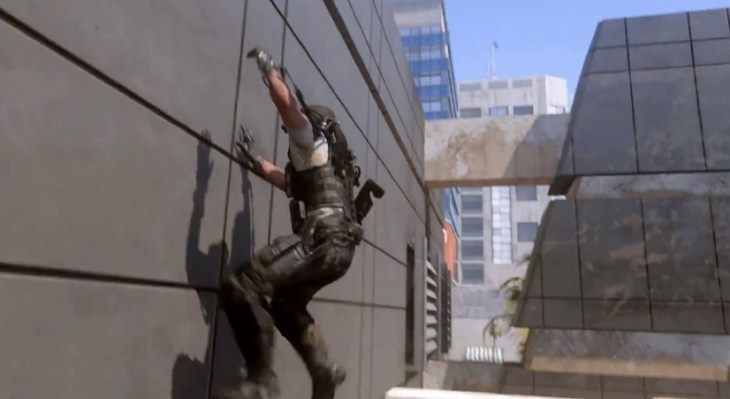 Verticality is still a big deal in shooter games and it looks like Advanced Warfare is going to include it as well. At the 1:43 mark we see a player activate power gloves and then instantly start climbing a vertical wall. Now this is all just fine in the single player version but if they add power gloves as a kill streak or option in the multiplayer it would really shake up the formula. Back when I was a kid the go-to shooter gameplay mechanic were exploding barrels. In the last generation waist-high concrete blocks just appeared everywhere. Well COD appears to have solved that now with what appears to be a portable metal wall that can be deployed anywhere on the battlefield to provide cover for you and your team. Again I need to see this in action in the multiplayer version as a team utilising these properly could easily change the way a fight is going and alter maps entirely. 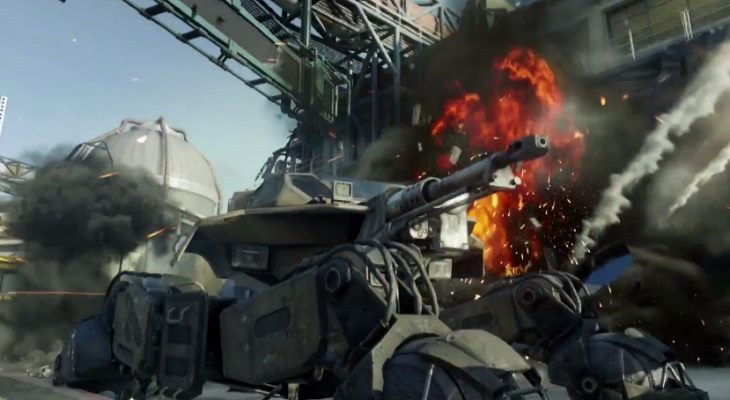 A lot of the end of the trailer is taken up with a montage of future technology such a walking tanks, rail guns, more exoskeletons than you can shake a stick at. And that’s it! The first trailer is done and dusted and the overarching idea behind it was that this one won’t be about countries but rather private companies. It also looks absolutely stunning and the increased agility of soldiers seems to be instrumental. It’s no surprise to see a release date of the 4th of November and if their previous marketing plans go the same don’t expect to hear much about the multiplayer aspect of Advanced Warfare until August this year. I’m a big fan of the high-intensity single player campaigns of Call of Duty and from what I’ve seen here I am definitely hopeful of something special this year.